Another cause? Defense attribution. This is a neuroscience concept that says essentially: “This (whatever injury has befallen the plaintiff) would never happen to me because I am smarter, or more careful, or more persistent,” or more whatever would have solved the issue to prevent the physician’s malpractice from actually resulting in harm to his patient. Although defense attribution is a very real psychological heuristic, or shortcut, which human beings do subconsciously, trial lawyers are expressly forbidden from asking the jury even to consider for a moment if the event being tried had happened to them? Georgia law prohibits me from asking the jury to consider: “What if this were me instead of the plaintiff?” It’s a ridiculous law and one most states don’t have. There are other causes, namely the law the judge gives the jury to frame the evidence they have just heard. Many of those jury instructions tilt the scales in favor of the doctor, so much so that there is often no way for a plaintiff, regardless of the compelling evidence presented, to overcome it. I’ll write another blog on those charges that really need to be changed. They are simply unfair. In the case I tried last week, the defense attorney, a well known attorney here in Atlanta who has been practicing for 40 years or so, had the audacity to make a motion to prohibit me from using the word “Justice” in the courtroom during the trial! Can you imagine. I told the judge that if this sacred courtroom and our civil justice system wasn’t about justice, then I don’t know what I have been devoting my life to the last 30 years. Of course, the trial judge didn’t grant the defense attorney’s frivolous, ridiculous motion, but the mere fact that a defense attorney, who has sworn to uphold the Constitution and the laws of the State of Georgia as I have, had the temerity to suggest the word “Justice” shouldn’t be uttered in a Court of Law is an indictment on what has happened to our Justice System. It is certainly an indictment on that particular attorney, too. One’s true colors show in times of stress and he certainly showed his utter lack of respect for the Court, the judge, for the Justice System, for the Constitution and for the Jury. Last week I tried a medical malpractice wrongful death case. The jury decided the case in favor of the defendant doctor and against the family who had lost their loved one. The case involved the failure by the doctor to refer the deceased to a neurosurgeon once the doctor, an orthopedic, incidentally discovered his patient had a 2.9 cm aneurysm in her brain. It was a ticking time-bomb in her head. The doctor was made aware of the time-bomb in his patient’s head, told her about it, and told her he would make sure she got into the hands of a neurosurgeon at Emory who could treat it. Guess what? He didn’t do that. She never even got to see the neurosurgeon. The aneurysm ruptured and she died. Interestingly, brain aneurysm are very treatable with a high (over 95%) success rate if treated prior to rupture. There was no question she would still be with us on earth had the orthopedic (who she was seeing for a shoulder injury) had simply picked up the phone and called the neurosurgeon and said something like:” Dr. ______, I have a patient with a 2.9 cm aneurysm in her brain. I think she needs to be seen by you right away. Can you please make sure you see her today or tomorrow?” But this physician never even bothered to pick up the phone. His testimony at trial was that it wouldn’t be the best use of his time to call another physician and that was for his staff to do. Just unbelievable. The jury refused to hold this physician accountable. After the jury announced its verdict for the doctor, the doctor and his lawyers jumped up and down in open celebration in the courtroom, having no respect for my client’s family. And no class. Another recent medical malpractice case tried in Fulton County (that I was not involved in) also ended in a seemingly unjust verdict for the physician. In that case, a 53 year old man died after the Defendant Doctor performed a discectomy and fusion on two cervical vertebrae in April 2004 to relieve herniated discs. The patient’s neck began to swell and the physician was alleged not to have ordered diagnostic tests or any additional treatment quickly enough to save the man’s life. The jury was not allowed to hear managed evidence that the physician’s hospital privileges were suspended less than two years after the death of 53-year-old and that the defendant doctor had been subject to eight other malpractice suits in Georgia and Nebraska before and after the incident, according to attorneys on both sides of the case. Where is the justice in that verdict? This verdict, the same week of the verdict in the case I tried, has pushed me over the edge of concluding juries in Georgia can not deliver justice for a family who lost a loved one due to a physician’s negligence. They just refuse to do it. 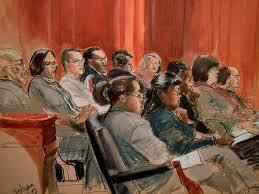 These jurors must now live with themselves. I hope they thought about the missing family members in these two cases at the Thanksgiving gathering at their household. They have to look themselves in the mirror every day and think “I let that doctor get away with that.” I wouldn’t want that burden on my shoulders. So you may understand why I am having trouble with the concept of justice right now. I am sure at some point I’ll come around. In the meantime, I will continue to fight the good fight, though, and hope justice doesn’t continue to get the short shrift in our state and country.